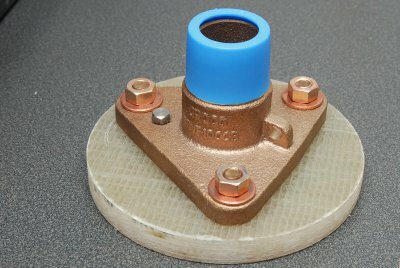 Many boaters have asked me how to install stronger, flanged seacocks without also drilling extra holes in your hull for the bolts that hold the flange. It can be done, as you will see below. Though this is going to be slightly less robust, in strength than through bolting, I would have no qualms about using this method on my own boat. I do admittedly through bolt on my own vessel out of personal preference. Don't get me wrong this is still a robust installation, if done with care & patience, and it is stronger than the hundreds of thousands of vessels out there with noting more than a valve threaded to a thru-hull. This is also a decent option for those with cored hulls where thin external skins are to thin to take the countersink depth of the bolt head. 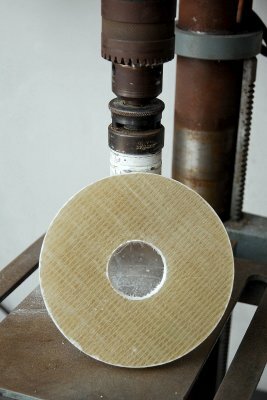 This article already assumes you're using GPO-3 polyester/fiberglass or G-10 epoxy/fiberglass sheet for the backer blocks, and have already made the circle/donut. This article also assumes you are utterly opposed to through-bolting your seacocks to the hull. For tapping I recommend a thickness of about 5/8" for your GPO-3 or G-10. In testing I have exceeded 1000 pounds of direct pull on 1/2" home made polyester fiberglass board. G-10 and GPO-3 are far stronger than my home made fiberglass sheet and the extra thickness yields even more strength. 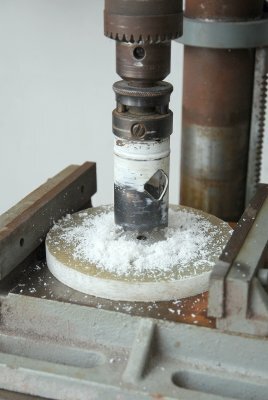 Unlike the other method where you glass the backing plate to the hull first then drill the hole for the thru-hull with this method you drill the thru-hull hole first. To do this project a drill press is HIGHLY recommended. By using the pilot hole you made the original circle with you will automatically have a perfectly centered hole in the backing plate. Be sure to use a hole saw as close to the OD size of the thru-hull as is humanly possible. There should be very little room between the threads and the fiberglass. Please be aware that working with G-10 or even GPO-3 board is like working with steel. It eats tools for lunch. Before you drill and tap the backer block you need to tighten the flanged adapter to the backing block using the thru-hull. Because you are missing the thickness of the hull you will need to create a spacer that takes the hulls place. I used some PVC exterior trim lumber and drilled the same diameter hole as in the backing block. Then all I did was center & tighten the flange and thru-hull together with the backing plate and spacer sandwiched in between. 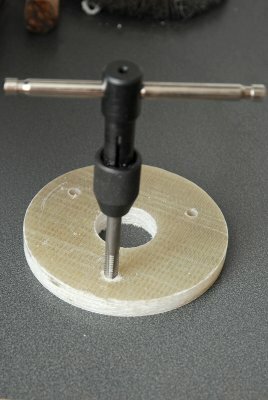 This is the most critical step and why you really should have a drill press. 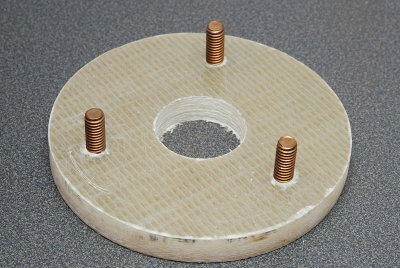 Because you are literally drilling and tapping a piece of 5/8" fiberglass or epoxy sheet, the threaded holes MUST be perfectly centered in the flange holes, and they must be 100% vertical. I made my spacer square, and wider than the head of the thru-hull, so I was able to clamp it in my drill press vice. I can not stress enough how important it is to make perfectly vertical holes that are perfectly centered in the holes of the flange or seacock. There is NO wiggle room here. Mess this up and you just wrecked the backing block.. Please don't cut corners on the quality of your tap and always use the proper sized drill for the tap. 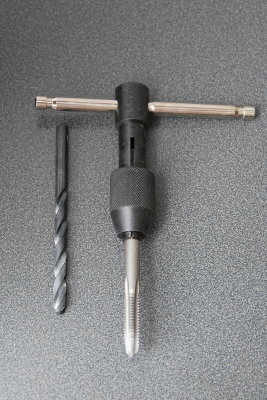 This is an "F" drill for a 5/16" X 18 thread tap. You can also use a 17/64" drill with a 5/16" tap. Fiberglass or epoxy sheet is susceptible to off center tapping so be careful to not cut crooked or wobble your tap side to side as it will make the tapping bigger than you want. Practice in a scrap piece of fiberglass first if your not comfortable with this. 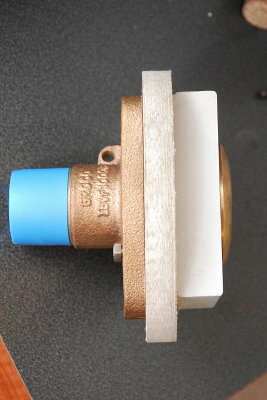 Once tapped through use an air gun to blow the flutes of the tap out. Do this before reversing it out of the fiberglass.. This is fairly straight forward but remember to tap this totally vertical. Avoid over tapping or multiple tries or passes. Each pass will remove more material, once in, once out..
Silicon bronze threaded rod is expensive but silicon bronze carriage bolts are cheap. 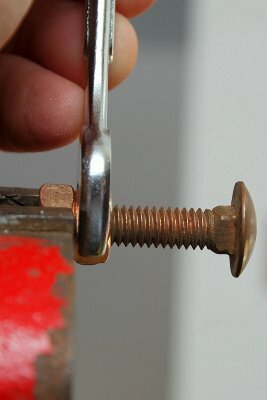 Simply install two nuts onto the bolt and clamp only one of the nuts in the vice while tightening the other back onto it. This essentially locks the bolt into the vice so you can cut it without it spinning or moving. 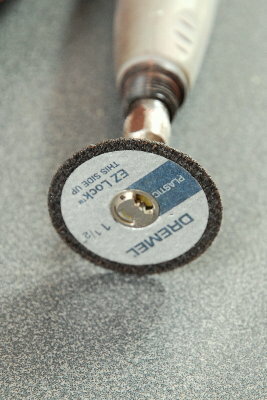 Though this 1 1/2" Dremel cut-off disc says "Plastic" it is my favorite tool for cutting bolts or threaded rod, and it works equally well on stainless or bronze. 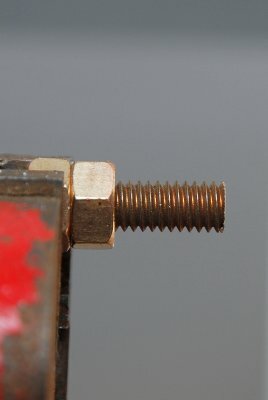 As you get good with the Dremel you can make some amazing bolt cuts with threads that work as good as factory. Of course you could use a hack saw too but the Dremel is nice. 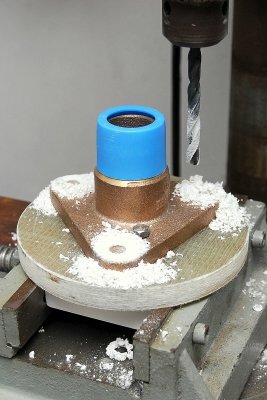 Once I have cut the bolt I then clean the cut end on my bench grinder with a brass wire wheel. This one looks almost as good as the factory end and works the same too. With the studs made you simply thread them into the backing block. If you got a little aggressive with the tap it's not the end of the world. Mix up some slightly thickened epoxy and apply with a syringe into the hole, wax the stud and thread it in with the thickened epoxy and let it cure. 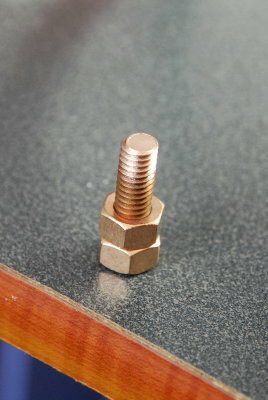 This will create a nearly perfect thread interface between the stud and backing plate. Even with a good tap I still dip the stud into epoxy, coat the inside of the hole and thread it in. Once the studs are in simply drop the flange over it put on the nuts. You're now ready for a dry test fit in the hull.